Plants cannot be green without magnesium, but too much magnesium in the soil can turn plants yellow. How can this be? ​Magnesium is essential for plant health. Magnesium stabilizes cell membranes, making plants better able to withstand drought and sunburn. Magnesium is found in enzymes that plants use to metabolize carbohydrates. Most important, magnesium is contained in the chlorophyll molecules that convert the sun’s energy into food. This process, the Calvin Cycle, is what makes photosynthesis possible. Clearly, magnesium is important to plant health. But too much magnesium can interfere with the absorption of other plant nutrients. ​The chemical interplay, taking place in the soil, that allows plants to absorb nutrients, is a delicate balancing act. Too much, or not enough, of one nutrient can create a domino effect that causes starvation for plants that are surrounded by a banquet of nutrients. Magnesium is an elemental metal. Pure magnesium (Mg) is too stable of a molecule for plants to absorb. The less stable, cation form of magnesium (Mg2+) is a dissolved salt that plants use for food. To be able to attract and hold those positively charged molecules, plants also need negatively charged molecules (anions), such as nitrogen, phosphorus, and sulfur. The ability of soil to perform this balancing act is called its Cation Exchange Capacity (CEC). Without a soil test from a reputable, local lab, you cannot know your soil’s CEC or nutrient levels. For example: My first soil test found magnesium levels of 798 parts per million (ppm). The ideal range is 50 to 120ppm. Clearly, before I moved in, someone was applying an awful lot of fertilizer. The problem they were probably trying to correct was not insufficient nutrients, but a nutrient imbalance. Without a soil test from a local, reputable lab, you simply do not have enough information. Soil test results also include base saturation figures for potassium, calcium, and magnesium. Base saturation is the percentage of available connections being used. [Think of it as how many grocery bags you can carry in from your car.] The optimal range for magnesium base saturation is 10 to 30%. This means that soil particles, because of their electrical charge, will ideally hold on to 10 to 30% of the magnesium in the soil. It takes the right absorption percentage and the right volume of magnesium in the soil for plants to be healthy. My soil’s magnesium base saturation was 32%. That sounds close enough to the 10 to 30% optimal range, right? The problem is, with seven times the amount of magnesium needed in the soil, my plants were getting 32% of too much. ​Too much magnesium in the soil makes it difficult for plants to absorb calcium and other anion nutrients, which can lead to blossom end rot, bronzing, and many other problems. This is a common problem in areas with alkaline soil. The opposite is true in areas with acidic soil. Insufficient magnesium symptoms look very much like potassium toxicity symptoms: older leaves, at the bottom of the plant, start turning brown, between and alongside the leaf veins, working upward through the plant. Magnesium deficiencies in stone fruits often start out as slightly brown areas along leaf edges (margins) that expand inward, causing cracking, necrosis, and leaf loss. 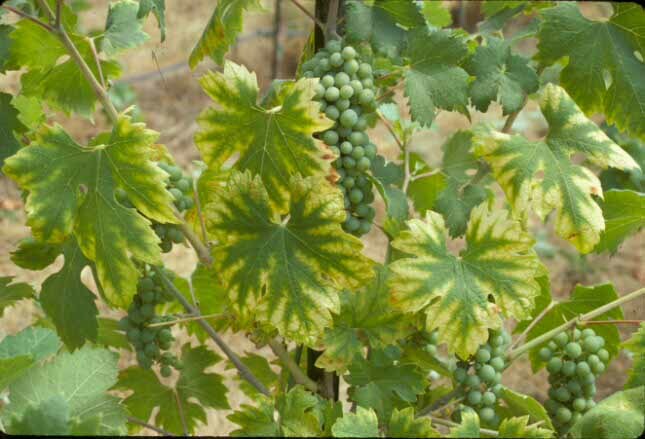 Magnesium deficiency in California is extremely rare. Local water supply Irrigation water that is more alkaline, such as we have in the Bay Area, tends to make calcium and magnesium less soluble, and harder for plants to absorb. This is because of carbonate and bicarbonate ions in the soil. The chemical transformation between these molecules also tends to leave salts behind. Soil pH Acidifying alkaline soil with ammonium sulfate or sulfur can help reduce the number of ions (Residual Sodium Carbonates) that make magnesium more available to your plants. If you have acidic soil, wood ashes can be a good source of magnesium and other plant nutrients. Soil structure Compacted soil makes it difficult for plant roots to access nutrients. Overly loose (sandy) soil cannot hold nutrients long enough for roots to find them. Incorporating organic matter as a top dressing will improve soil structure and soil health, leading to healthier plants. Compost Applying compost, mulch, and green manure are good ways to add magnesium and other plant nutrients to your soil. Finally, schedule regular soil tests for your garden and landscape. Look at these tests as an annual physical for the living skin of your property. The information in these tests will help you make informed decisions about the magnesium in your soil.